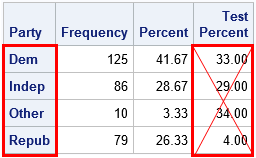 Programmers on a SAS discussion forum recently asked about the chi-square test for proportions as implemented in PROC FREQ in SAS. One person asked the basic question, "how do I test the null hypothesis that the observed proportions are equal to a set of known proportions?" Another person said that the null hypothesis was rejected for his data, and he wanted to know which categories were "responsible for the rejection." This article answers both questions and points out a potential pitfall when you specify the proportions for a chi-square goodness-of-fit test in PROC FREQ. The analysis is now correctly specified. 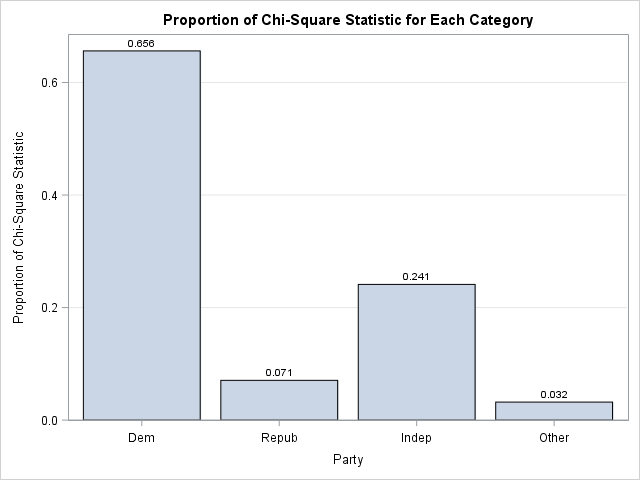 The chi-square table indicates that the observed proportions are significantly different from the national averages at the α = 0.05 significance level. Which categories are "responsible" for rejecting the null hypothesis? 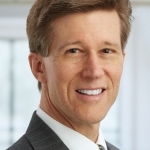 A SAS programmer posted a similar analysis on a discussion and asked whether it was possible to determine which categories were the most different from the specified proportions. The analysis shows that the chi-square test rejects the null hypothesis, but does not indicate whether only one category is different than expected or whether many categories are different. where frequency is the table cell frequency (count) and expected is the expected cell frequency" under the null hypothesis. The table shows the numbers used to compute the chi-square statistic. 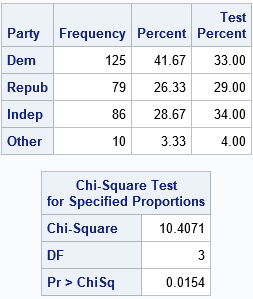 For each category of the PARTY variable, the table shows the expected frequencies, the deviations from the expected frequencies, and the chi-square term for each category. The last column is the proportion of the total chi-square statistic for each category. You can see that the 'Dem' category contributes the greatest proportion. The interpretation is that the observed count of the 'Dem' group is much greater than expected and this is the primary reason why the null hypothesis is rejected. The 'Dem' group contributes the most to the chi-square statistic because the observed counts are "too big." The 'Indep' group contributes a moderate amount because the counts are "too small." The remaining groups do not contribute much because their counts are "just right." In summary, this article addresses three topics related to testing the proportions of counts in a one-way frequency table. You can use the TESTP= option to specify the proportions for the null hypothesis. Be sure that you specify the proportions in the same order that they appear in the OneWayFreqs table. (The ORDER=DATA option is sometimes useful for this.) If the data proportions do not fit the null hypothesis, you might want to know why. One way to answer this question is to compute the contributions of each category to the total chi-square computation. This article shows how to display that information in a table or in a bar chart.